Which Vancouver neighbourhoods are the best? Where can one find apartments for rent in Vancouver? Where is the best place to live in Vancouver for young singles or young families? Where to live in Vancouver depends on your preferences. This article outlines the most common Vancouver neighbourhoods for newcomers to the city. Deciding where to live in Vancouver can take a while. Try not to commit to a location long term until you have arrived and seen more of the city. There is a steady flow of rented accommodation in Vancouver. If you are looking to live in one of the Vancouver neighbourhoods close to downtown, you will find that many apartments for rent in Vancouver do not use media to advertise. Instead, they will post notices outside the buildings to advertise vacancies. It’s worth walking around Vancouver neighbourhoods you want to live in and look for ‘For rent’ signs. You can also try calling the property management companies to check if there are any vacancies. Popular websites for looking for accommodation in Vancouver include Craigslist, PadMapper, and Kijiji. You can also click here to get a discount from Airbnb from Moving2Canada. Aerial shot of Downtown Vancouver, courtesy of Tourism Vancouver. If you choose to live in the Downtown area, you can most likely expect to live in a high-rise residential unit. Depending on the location, rent can be pretty expensive when you have limited income. But it is possible to find affordable apartments for rent in Vancouver’s Downtown core with some searching. Here, you are only minutes away from the main shopping district (Robson Street and Pacific Centre Mall), the business district, and the entertainment district, Granville Street. The sea wall and Stanley Park are also close by. The West End, located in the Downtown area, is the most affordable of all the Downtown locations. The West End is bordered by Downtown, Stanley Park, and the ocean. It’s the most diverse of all the Downtown Vancouver neighbourhoods. A mix of Canadians, immigrants, and international transient residents — both young and old — offers more of a community feel to this Vancouver neighbourhood. There is a good mix between town-homes, duplexes, large heritage homes, and older high-rise units. The West End has long been a popular place among the LGBT community when searching where to live in Vancouver. It also boasts an eclectic blend of quality eateries at affordable prices. Some of the older residential towers offer one-bedroom apartments for rent in Vancouver for $900-$1,100. Studio/bachelor apartments (i.e. no separate bedroom) cost around $750-$900, and two-bedroom apartments typically range from $1,200-$1,600. You can also find duplexes in the $500-$900 range. Yaletown, which used to be a rail yard in the 19th century, is situated in the south-east Downtown area. The railway loading docks from this era have been converted into restaurant and cafe patios. The warehouses have been converted into lofts. Its upscale restaurants, boutique stores, nightclubs, and access to the False Creek marina make this area a playground for Vancouver’s elite. It’s extremely expensive to rent in Yaletown and might be considered poor value for your money. You are paying to be part of one of the trendiest Vancouver neighbourhoods. A typical two-bed condo (i.e. high-rise apartment) can cost $1,800-$2,500 per month. Gastown, an area to the east of the Downtown area, was established in 1867, the same year Canada became a nation. Despite being in close proximity to the poverty-stricken Vancouver neighbourhoods in the East Hastings Street area, Gastown is currently experiencing a revival. It offers a refreshing mix of old and new. During the day, tourists flock to this area for its historic charm. But you’ll also find some of the best restaurants, bars, and shopping of all Vancouver neighbourhoods. In terms of housing costs, Gastown has slightly more reasonably-priced apartments for rent in Vancouver than Yaletown. A typical two-bedroom condo can cost from $1,700-$2,200 per month. Coal Harbour, represents the northern section of the Downtown residential area. This is one of the most affluent Vancouver neighbourhoods. It’s populated mainly by older professionals and retirees. It consists of high-rise condo units with very close access to the sea wall and marina to the north. Rent prices are around $1,600-$2,500 per month for a two-bedroom condo. Find out what it’s like living in Vancouver. Kitsilano (Kits) is on the West Side of the city, and is home to many young families and students. It’s also popular among those searching where to live in Vancouver, because it’s lined with two of Vancouver’s most famous beaches, Kits Beach and Jericho Beach. It also has great views of Downtown and the North Shore mountains. Kits is a hub of activity during the summer months. It has yoga studios, organic markets, cafes and Vancouver’s Greektown. Rent is expensive around the Kits Beach area, but prices decrease rapidly as you go west towards UBC, or south below West Broadway Street (9th Ave). For these reasons there is a wide variation in rent prices. A room in a two or three bedroom house renting for around $550-$850/month, depending on the area. East Vancouver, or East Van as it’s lovingly called, encompasses the area east of Main Street. You likely won’t want to live in the Downtown area immediately to the east of Main Street. The area around East Hastings and the Downtown Eastside is renownedfor its levels of drug use, poverty, crime, mental illness, prostitution, and homelessness. That being said, it’ss also known for its strong community resilience and history of social activism. But further east you will find interesting, eclectic Vancouver neighbourhoods with reasonable rent prices. If you’re searching where to live in Vancouver and want somewhere that’s the antithesis of ‘slick’ Downtown Vancouver, then East Van’s down-to-earth vibe may be for you. It’s where blue collar workers, young couples, families, and students go when looking where to live in Vancouver. As a result, this area offers much more affordable apartments for rent in Vancouver than the Downtown core. Main Street begins in Gastown, runs through Chinatown and the Downtown Eastside, and continues running south. It is a mecca of fashion, art, and design boutiques, as well as a diverse and affordable area for groceries, restaurants, and cafes. This is Vancouver’s go-to place for local artists and designers. It’s home to one-of-a-kind fashion, handmade crafts, and accessories. Here, family-run eateries can be found alongside upscale restaurants. Commercial Drive, known as “The Drive”, is an area in East Van close to Downtown. It has a close-knit, community feel to it with affordable rent prices. With the Commercial-Broadway SkyTrain station, and several high-frequency bus routes, it is well-served by public transit. This is the type of Vancouver neighbourhood where you’ll find plenty of artists and musicians, as well as old Italian men watching soccer on TV and enjoying wine or espresso on the numerous patios in the summertime. Commercial Drive is a mix of residential and commercial. It has a high proportion of ethnic and vegetarian restaurants, businesses, and social housing. It has been the destination for generations of immigrants wondering where to live in Vancouver. Italian, Asian, Latin American, East Indian, and African communities have made it their home. The community is populated with large Edwardian-style heritage buildings with a fantastic selection of cafes, bars, and restaurants. If you are looking to live in a larger house with a backyard, this is one of the ideal Vancouver neighbourhoods. Be advised that many of the rental houses are split into several bedrooms and you will most likely have to share the house. Typical rent is around $500-$700 per room, or around $1,000 for a basement suite. South Granville, located south of Downtown across the Granville Street bridge, offers excellent public transport with express bus lines running to Vancouver neighbourhoods around the University of British Columbia, the airport, East Vancouver, and beyond. It features slightly more affordable apartments for rent in Vancouver than Downtown with a great selection of bars and restaurants. It’s only five minutes by bus downtown, and a 15-minute walk to Granville Island. This is an island in the middle of the city with waterfront restaurants, theatres, galleries, studios and a top-notch fresh food market, Granville Island Public Market. Its pretty streetscapes, variety of amenities, proximity to Downtown, and mix of high-rise and low-rise accommodation make it an attractive option when researching where to live in Vancouver. Explore these 11 things to do in Vancouver. 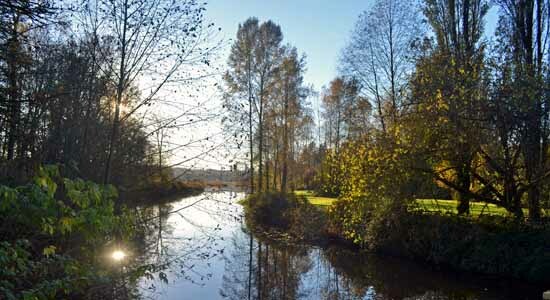 The Brunette River, as it enters Burnaby Lake. Burnaby, which is a city of its own, borders Vancouver to the east. Like much of Greater Vancouver, Burnaby has large ethnic and immigrant communities. It’s very accessible to Downtown Vancouver via transit, and its cheaper rents make it attractive when researching where to live in Vancouver. The SkyTrain rapid transit system crosses Burnaby from east to west in two places. The Expo Line crosses the south along Kingsway, and the Millennium Line follows Lougheed Highway. North Vancouver’s Lonsdale Quay Market. North Vancouver neighbourhoods are growing in popularity among new arrivals. Like Burnaby, it’s a city in its own right and is very much family-oriented. However, cheaper rents and easy access to the North Shore mountains for biking and snowboarding is making it popular with newcomers. Many people working on the local mountains tend to stay in North Vancouver neighbourhoods. There is a broad range of accommodation and services to be found on and around Lonsdale Avenue, which runs north from the SeaBus terminal. Other options include Marine Drive, the main east-west route, and in Lynn Valley Village, located approximately 30 minutes north of the waterfront. Transport to downtown is via the SeaBus. It leaves for downtown every 15 minutes on-peak, or every 30 minutess off-peak. Bus services also operate. Located at the most western point of Vancouver, the University of British Columbia (UBC) is 10 kilometres from Downtown. The university grounds capture an area of almost 1,000 acres, and house almost 35,000 students. It offers great access to public transport and many local beaches (Wreck, Spanish Banks). It also has a great college environment. This area is extremely popular with students on temporary permits searching where to live in Vancouver. The nearby endowment lands of the University offers attractive nature and walking trails. Kerrisdale is located south of Kitsilano. Many of Vancouver’s affluent elderly go to retire in high-rise condos. The shops are quaint and targeted towards senior citizens. However, this area offers affordable apartments for rent in Vancouver, and houses also. It’s one of the Vancouver neighbourhoods popular with UBC students, as it’s a quick bus ride to the university. You can get to the Kitsilano area in 15-20 minutes, and to the downtown core in 25-30 minutes via transit. 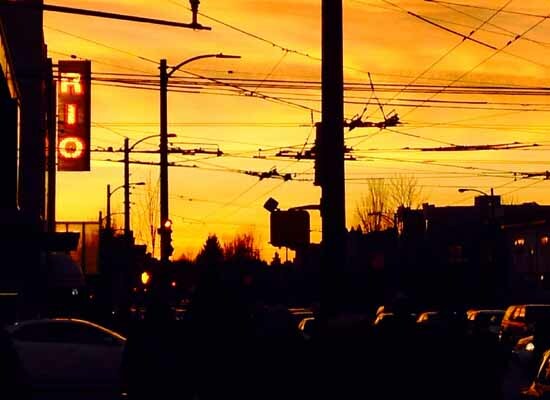 Located further south beyond 49th St, the Marpole area offers great value apartments for rent in Vancouver as it’s well-served by public transport along Oak and Granville St. This area is a lot more family-oriented than other Vancouver neighbourhoods. As a result, there is not much going on in terms of bars or restaurants. In exchange, you get larger bedrooms and gardens. If you’re researching where to live in Vancouver for a group of people looking to rent a house with several bedrooms, this area may be for you. Still undecided on where to live in Vancouver? Still don’t have a favourite out of all the Vancouver neighbourhoods? If you are unsure it’s always best to speak with people living in each area before you decide where to live in Vancouver. There are a range of apartments for rent in Vancouver, so make sure to find the one that best suits your needs. Moving2Canada is here to help all those living in Vancouver. Researching Vancouver neighbourhoods from abroad? Where to buy travel insurance for Canada. How to adapt to the resume format in Canada (or ‘CV’). International Money Transfers to/from Canada. You can do this by downloading our Getting Started Guide to get our free immigration and settlement guide. You can opt in for free, relevant updates into your inbox. All photos, except where stated otherwise, are by Alan Regan. A unique work opportunity in Vancouver.